Participants were taken to some spots around the university where ghosts were said to exist. 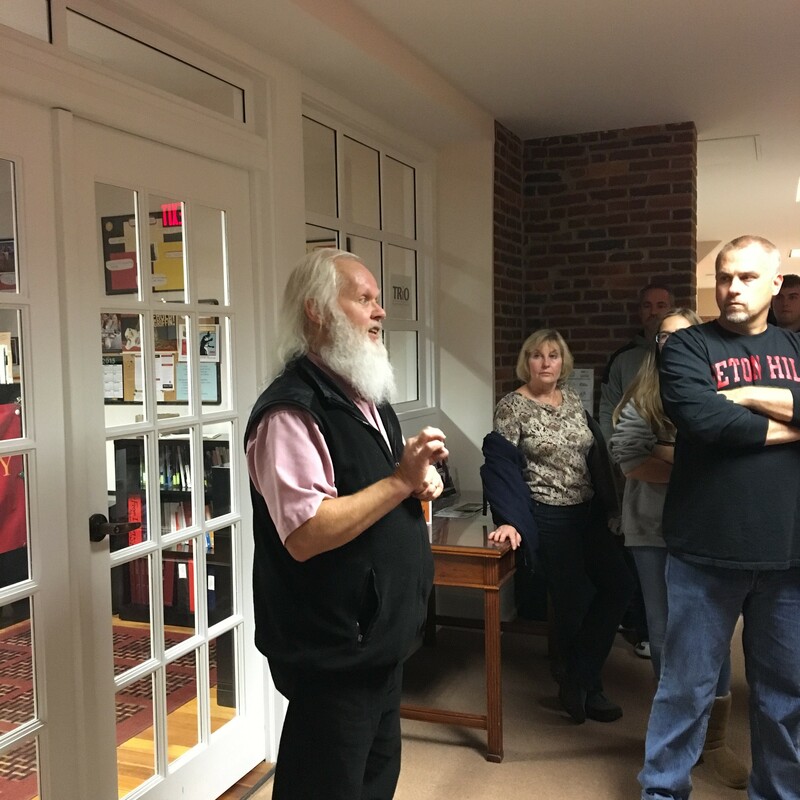 As planned, Bill Black, a professor and archivist at SHU, led the group and told ghost stories. Because many participants showed up, people were divided into three groups, led by different people. I followed the group of Black. Black took us to walk through some special classrooms of the Administration Building; the tunnel, the graveyard, St. Joseph’s Hall and St. Joseph’s Chapel. Black tells the group a story on the 5th floor of the admin. building. At the beginning of this event, he emphasized that these ghost stories come from not only the experience of students, but of faculty. He stopped at each site and told the ghost story that was believed to have happened at that specific spot. At first, I thought that this would be just a scary and funny trip. But the truth is, Black first introduced the history of each site and then told stories, which made this event more significant. For example, when we arrived at the tunnel, he told a story as following. 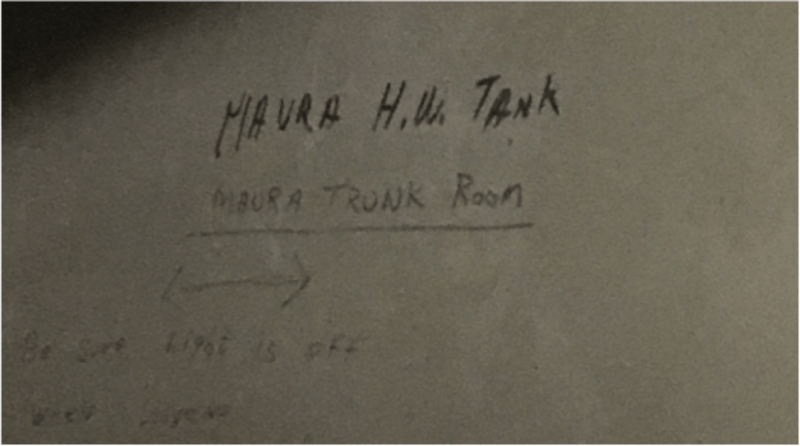 The words on the door inside the tunnel below Admin show the old Maura Trunk Room, which was used for girls to store their luggage between 1883 and 1947. It now holds the hot water tank and maybe a grumpy ghost. As a Chinese exchange student at SHU, when I first heard about the ghost tour, I was extremely shocked because it would be weird if a Chinese school held a formal event related to ghosts. In order to answer the question, I interviewed many people. “I am skeptical. I won’t say there is or there isn’t. But I believe there’s something that goes on,” Black said. During my interview, Black showed me some pictures of white orbs that appear in different places at SHU. They look very normal, like the round reflections of light. They have diverse patterns and are taken by a special machine under light-control condition. Then he showed me a picture of a view of a girl’s back. The scary thing is, the view is absolutely a girl’s back, though she is kind of transparent. Black told me that his daughter, Willa, now a junior at SHU, is sensitive to ghosts. Black obtained the picture when his daughter was eight years old, when he and his wife took their daughter out for an investigation. While the couple was doing their investigation carefully, they took a glance at their daughter and found that she was playing with a ball. They were shocked when Willa said she was playing with a ghost girl who agreed to have her picture taken. Writing seen during the tour. Photo courtesy by M. He. They didn’t notice anything unusual about it until they went back home and downloaded the photo. That is when they saw the image of the girl’s back. Are there real ghosts in the world? I still don’t know the answer, but I agree with what Black said: “To a child, there is nothing more interesting than a closed door.” When faced with the possibility of the supernatural, we are like a child with curiosity. After interviewing Bill Black, I also interviewed Willa. I was curious about what she thinks of her ability to see ghosts. We’ve all heard of the film called “The Six Sense” whose main character is a little boy who suffers from seeing the dead. I wonder, could Willa face the same effects? “I think it’s kind of like a gift for me. The rest of the world is color-blind, while I can see the color,” said Willa. As an atheist, I didn’t sleep well during the period I interviewed people about ghosts because I’m afraid of another world of ghosts, if they really exist. Why is Willa not afraid of ghosts? What are American’s attitudes towards ghosts? In order to answer these questions, I interviewed more people. I found that almost all Americans have a more natural attitude toward ghosts. Most of them are not afraid of it because they believe that ghosts will not do harm to them. Their reasons are various: Because I believe in God, they won’t do harm to people who believe in God; because I am a good person; because they can’t do harm to me, and so on. I think it is kind of related to the culture of religions in America. Do you believe in God? Do you believe in angels? Then, how about ghosts? But the culture of ghosts is kind of different in China: we really have more complicated attitudes toward ghosts. Most Chinese don’t have religion. Some of my friends are undoubtedly atheists, and some of them are really afraid of ghosts, especially girls. Take myself as an example. I can’t imagine there are ghosts in the world, and I can’t convince myself to not be afraid of ghosts if they really exist. I think the reason is related to culture. We don’t have a natural attitude towards ghosts because of a cultural belief that ghosts are part of feudalistic superstition. Every time my American friends ask me whether there is a holiday in China like Halloween, the answer is absolutely “NO.” I can’t imagine if there being a holiday related to ghosts in China. Ghosts are kind of like taboo in our society. For example, Chinese directors are not allowed to make a movie that tells a story with real ghosts. All the movies are censored and revised by The State Administration of Radio Film and Television before they are screened. At the end of the story, all the mysterious cases are explained, maybe it was a mental disease or man-made ghosts. But in fact, there are still lots of old scary films that tell stories about real ghosts, zombies, spirits and so on, which is maybe one of the reasons that make me afraid of ghosts. Simply judging belief in the supernatural, or the lackthereof, is kind of silly. However, knowing the differences in opinion different people have on this topic is so interesting. I still cheer for my American friends who are more playful with ghosts and superstitions.